Translated by: Carol Brown Janeway. Themes: Mathematics, science, travel, human interactions. 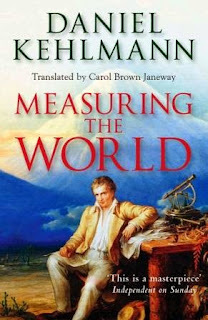 Kehlmann's novel is about two great men of the 19th century: Alexander von Humboldt and Carl Friedrick Gauss. Von Humboldt is best known as a naturalist, geographer and explorer, and Gauss is considered to have been one of the greatest mathematicians of all time. 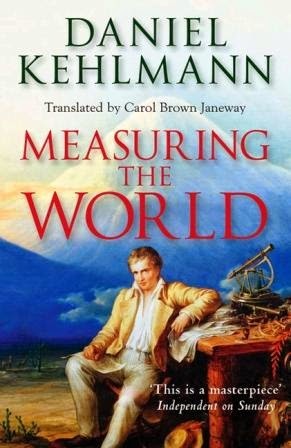 Both were pioneers in their respective fields and what Kehlmann focuses on in his book is that both men measured the known world - one travelling far and wide to do so and the other doing it all inside his own head, rarely leaving his home state. The narrative jumps around with alternating chapters about each man, going back and forth in time a little and showing the reader both men at various ages and stages of their careers. We also get to see parts of the story through the eyes of von Humboldt's long-suffering travel companion and collaborator, the French physician and botanist Aimé Bonpland, and those of Gauss' son, Eugene. We are shown two vastly different but equally driven men, one from a family of high status, the other the son of illiterate labourers, both of whom were young men when they began to attract attention for their brilliance. The narrative style is funny and occasionally poignant and always sparkling, and the translation is smooth and readable. Well worth reading, especially if you like narratives of travel/exploration and historical figures.